Have you ever seen that t-shirt with the sumo wrestler on it? You know, the one that says, “I’m big in Japan”? It’s a goofy play-on-words that equates the literal mass of the sumo wrestler to the figurative popularity of a presumed foreigner. Dan Orlowitz is a Philly native who works for the company that co-sponsored the film festival. 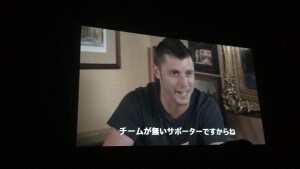 He approached Rothbury Roads Productions, the makers of the Sons of Ben Movie (who, it should be said, are not affiliated with the Sons of Ben), about entering the movie into the festival, then undertook the immense task of translating the film from English into Japanese. He recently took the time to answer a few questions about that process. 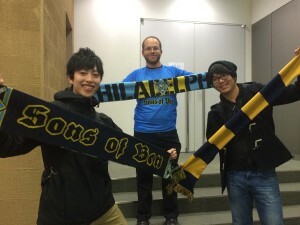 PSP: For those of us over here in the United States, it looks like the Sons of Ben have some new fans in Japan. Take us through what happened over there. Dan Orlowitz: There’s a longer version of the story, but the summary is that I’m a Philadelphian working as a soccer writer/photographer in Tokyo. 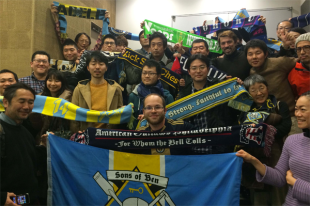 As a long-time Sons of Ben member and Union fan I’ve been very passionate about introducing Major League Soccer to Japanese fans; I’m a proponent of the league’s approach to new media and also how the supporter groups themselves operate and feel that both could benefit Japanese soccer culture as a whole. I’m currently working for a site called Football Channel (http://www.footballchannel.jp) and I was asked if I was interested in helping out with the Tokyo International Film Festival, which our parent company (Kanzen, a soccer-centric magazine/book publisher) was sponsoring. I’d been in touch with (director) Jeff Bell and (producer) Mike Dieffenbach about trying to get a Tokyo screening together in the past, so I emailed them again and we worked together to make it happen. After a lot of rushed translating — I spent all of January in Australia to cover the Asian Cup and we didn’t get the ‘final’ cut till the end of the month — the first screening happened on February 7th and that got us a lot of wonderful word-of-mouth for the second screening on the 8th. PSP: Why such a positive reaction to this film? What did people seem to enjoy about the story? Orlowitz: This idea of American soccer supporters being so organized and accomplishing something so big is something that Japanese fans would never have imagined possible. The way the Sons of Ben were organized, the clever ways in which they drew attention to themselves, the perseverance, and that Philadelphian attitude all resonated. To put that much effort into a a club that doesn’t exist yet! There’s a few Japanese clubs with histories similar to bits and pieces of the Union, but nothing that matches the complete package. 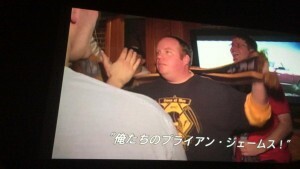 SOB co-founder Bryan James subtitled in Japanese. PSP: What goes into translating something like an entire movie? It seems like a pretty big endeavor. Orlowitz: I transcribed the entire thing, put it line-by-line into a spreadsheet, and then translated everything into Japanese with notes on certain Philadelphian turns of phrase or cultural references. I joke about having to translate so many four-letter words, but Japanese actually doesn’t have much swearing so it’s hard to get that nuance across. Yoshiaki Sei, the festival’s director, came in after that and did a lot of editing in order to make them subtitle-friendly, which was really the biggest task as it came in at the very last minute. There’s still a few sections I want to revise before we screen it again in Japan, and I’ve talked to Jeff about possibly getting the Japanese subtitles on the DVD when it eventually comes out. PSP: We don’t really know much about Japanese soccer here in the United States, what can you tell us about the beautiful game in Japan? Orlowitz: America and Japan are two long-lost family members in the soccer world; both are countries where it’s been a niche sport for many years and has only relatively recently started to make progress. The J-League is the country’s professional competition. It debuted in 1993 with 10 teams; the J1 and J2 now boast a total of 40 teams, while the semi-developmental J3 has another 13 clubs who are looking to achieve promotion to the J2 once they fulfill all of the requirements. There’s a lot of good things to say about the J-League: the technical level is generally pretty high, the league’s Club License System has helped ensure that clubs who want to turn pro do it the right way, and match days are affordable, family-friendly experiences with a lot of great color and atmosphere. That said, the J-League could learn a lot from the MLS when it comes to stadia, marketing/promotion, media usage, and encouraging supporter culture, just as the MLS could learn from the J-League’s 100 Year Vision of grassroots promotion and academy development. I’m a firm believer that if you took the J-League’s on-the-pitch product (including their academy system) and combined it with the MLS’s marketing acumen, you would easily have one of the top leagues in the world. PSP: I understand the movie also did well in Bilbao, Spain, and it looks like it was entered into other film festivals? You’d have to ask Jeff Bell or (SoB co-founder) Bryan James about Bilbao, but my understanding is that former US coach Bob Bradley took in a screening. Any time you can get a coach to sit down for a couple hours to watch something that isn’t game footage, clearly you’ve done something right! It’s been a long, hard road to get the film done, but Jeff’s done a fantastic job and it’s terrific that this story finally gets to be told to a global audience. The world is finally starting to take the US national team seriously after Brazil 2014, and maybe SOB:TM will earn MLS fans the respect they deserve too. The SOB movie will be shown next in Barcelona, on March 12th, at the Offside Festival. Author: Kevin Kinkead Kevin Kinkead is an Emmy award-winning journalist. He currently writes for Philly Voice and previously wrote for Philadelphiaunion.com and worked as a producer for CBS 3 Eyewitness News in Philadelphia. Follow him on Twitter at @Kevin_Kinkead. 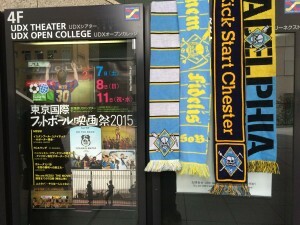 Memo to the Union Front Office: get an exhibition tour with J-League teams scheduled for next off-season. how do i see this movie? with or without Japanese subtitles.